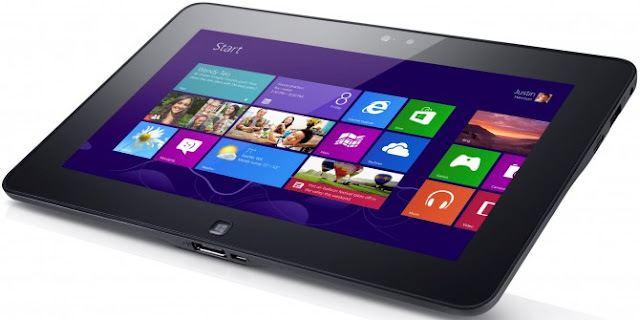 The Dell Latitude 10 bring the Americans to a tablet on the market, which is intended for use in the business. Accordingly, there are numerous features such as a replaceable battery. Together with Acer, Samsung and ASUS has also some Dell Windows 8 tablet on offer. One of them is the Dell Latitude 10 , the American company that has been presented in more detail in a video and demonstrates the use of the work. The Dell Latitude 10 is aimed not so much to ordinary consumers, but rather to business customers. Accordingly, the 10.1-inch tablet comes with several interesting features such as a replaceable battery. Especially in the case Tablets notoriously rare. The Dell Latitude 10 has. A 10.1 inch IPS display with 1366 × 768 pixels Including hides the already familiar Intel Atom Z2760 dual core processor, which can be found for example in the Samsung Smart Ativ PC. To 2GB of RAM and a SSD come with different capacities. The cheapest version of the Latitude 10 with 789 euros is unfortunately quite expensive, but it is just not directly compete with iPad and Co. but rather come to work for use. When the price is way no taxes there. If that Latitude 10 is too expensive and still want to have a tablet from Dell, which may be used for Dell XPS 10 attack. In this device, however, puts an ARM processor and accordingly RT Windows preinstalled. A desktop PC or a Ultrabook you can not replace it, what with the Latitude 10 would be possible.